At Prestonbrook Dental, it is our goal to provide optimal dental health for every member of your family, and to treat each person as if they belonged to our own family. Because building a foundation of trust is vital to the overall mission of Prestonbrook Dental, your individual dental needs and concerns will be personally addressed by Dr. Chaudhry. 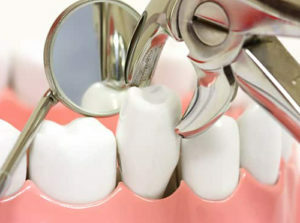 When your tooth has a cavity, you will need a good filling. 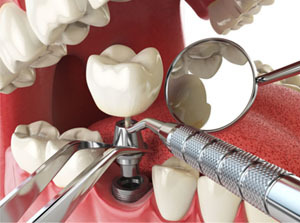 At Prestonbrook Dental, the cavity will be removed easily and comfortably. Also, we provide different filling materials with different colors to provide the optimal result and for your satisfaction. Dental implants are replacement tooth roots. Implants provide a strong foundation for fixed (permanent) or removable replacement teeth that are made to match your natural teeth. Please consult with Dr. Chaudhry to see if you are a good candidate for Dental Implants. Crowns or “caps” are traditional and commonly used restorations in dentistry today. Because the enamel has to be completely removed for a crown or “cap”, the stronger and more conservative onlay or porcelain veneer restoration is generally the treatment of choice whenever possible. A root canal is a treatment used to repair and save a tooth that is badly decayed or becomes infected. During a root canal procedure, the nerve and pulp are removed and the inside of the tooth is cleaned and sealed. Without treatment, the tissue surrounding the tooth will become infected and abscesses may form. If the infection is caught early enough, the procedure is generally painless and can be completed in one visit. Our preventive measures ensure the continued good health of your gums and teeth. We’ll also take special care of existing dental work and any implants or prostheses you may have.In the process, we develop customized preventive concepts for both children and adults. Healthy gums are very important for healthy teeth. Here at Prestonbrook Dental, we care about your gums. Dr. Chaudry is a leading and experienced periodontist Frisco TX. He is here to help with gum health and care. Teeth whitening is one of the safest, quickest, and most immediately rewarding cosmetic dentistry procedures available. We offer a variety of methods for teeth whitening Frisco, TX, at Prestonbrook Dental. Some procedures are conducted in our office, others you can perform on your own at home. It’s vital to request a brief consultation with Dr. Chaudhry prior to choosing a whitening system. Traditional braces are more effective at treating extreme overcrowding than other options like clear braces or Invisalign aligners and are less expensive. They give your orthodontist the control he needs to move the teeth in small increments at a time. The main disadvantage of traditional braces is the metal mouth appearance. 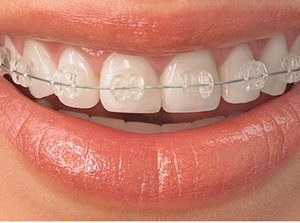 Ceramic braces (Tooth Colored Braces) have brackets made of ceramic or porcelain. 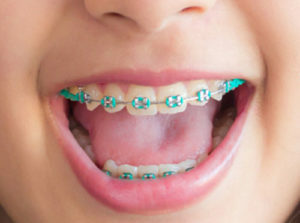 The brackets can be clear or else colored to be the same color as your teeth. Thus, they usually blend in with your teeth much better than metal braces. (if you have darker teeth, having tooth colored braces might be a better option. )It used to be that only the brackets for these braces were ceramic, while the wire itself was made of metal. 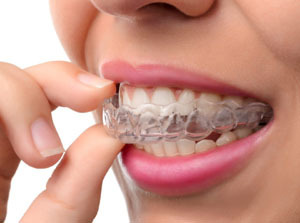 These days clear wires are available as well, making these braces even less visible. We are best interest is to save your natural tooth by keeping it healthy. However, there are cases that extraction becomes inevitable especially when severe infection/pain persists or cavity is too advanced.